The second in a series of four, “Veritas,” in Latin, means “Truth.” In a day where truth is often hard to come by, as we are questioned daily through the news, the question from Pilate was, “What is truth.” For me, the truth always comes back to Nature. It doesn't know anything but truth, being, what IS. I have chosen the sun piercing through the clouds as my motif for truth. The seminal start of my massive cloud explorations, it all fell together in this piece. There’s nothing like the first one setting the table. 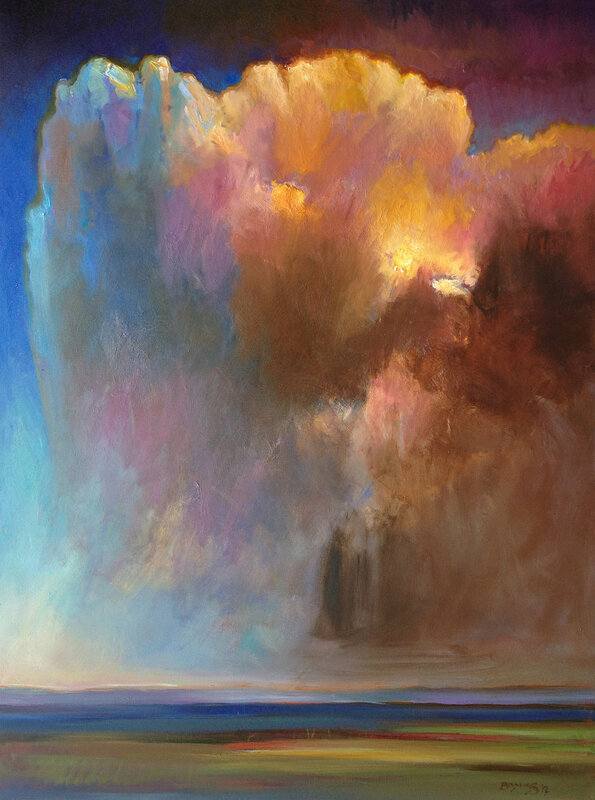 My original cloud piece, with an inspiration from the Oregon Coast during a blustery day. 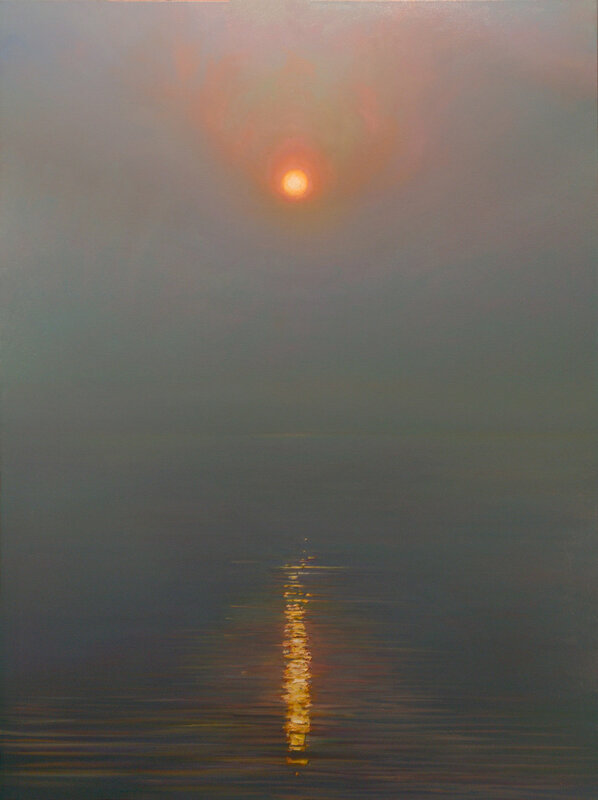 My inspiration also came from see, for the first time, a seascape of Gerhard Richter. From then on, I took the motif and made it my own. To be in the midst of painting a number of smaller, detailed, landscapes and seascapes currently, I’ve had the opportunity to work on a couple of commissions of more truly evocative, emotive, semi-abstract paintings. They presented me with a unique challenge of revisiting and recreating two works that were all about emotion, response, and non-objective painting from the gut. No small task. There is something about the confluence of power and beauty, a force of Nature witnessed. 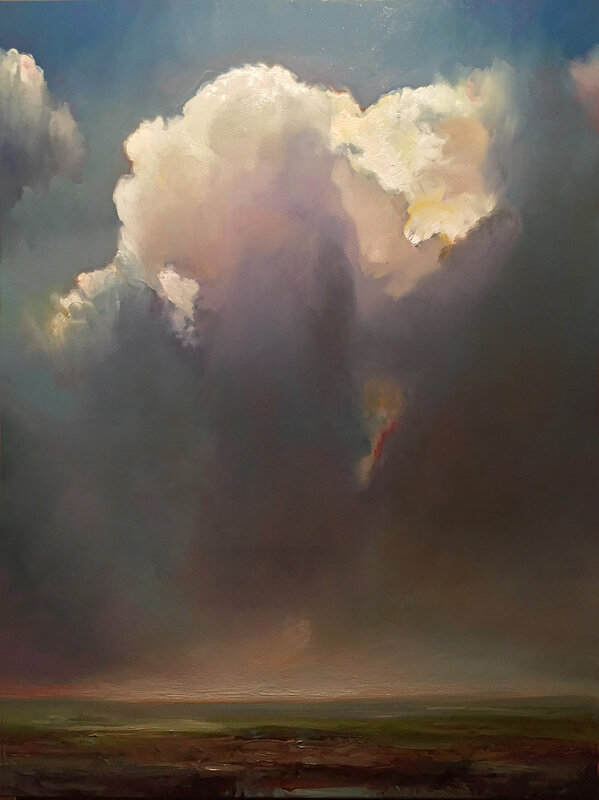 But this oil on canvas painting is not just about a large thunderhead, as it is entitled, “Covenant,” or an agreement between the intensions of Spirit, of the Divine, and the human. It’s a place where I just want to take off my shoes - an act of trust and submission to the superior force - and stand back and observe what’s before me...and consequently, feel the Divine. This is the first of two of the Andromeda series. To be in the midst of painting a number of smaller, detailed, landscapes and seascapes currently, I’ve had the opportunity to work on a couple of commissions of more truly evocative, emotive, semi-abstract paintings. They presented me with a unique challenge of revisiting and recreating two works that were all about emotion, response, and non-objective painting from the gut. No small task. A visitor who came to one of my open studios, after viewing this painting for a while, told me he was a pilot, and that he actually flew on the Space Shuttle a few times. 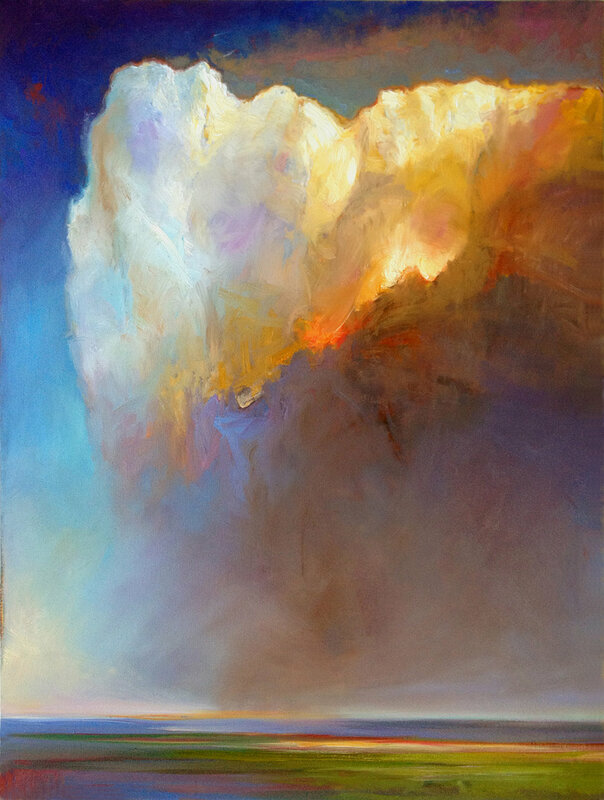 He told me that I had captured the most intriguing vantage point with this painting, where you are no longer looking up at the cloud, as we usually do on land, nor looking down on clouds as we fly across country. He told me I caught the view that only pilots see — that of actually flying into the cloud head-on. This is a very powerful painting for me, as it entails a variety of elements. This monolith of a cloud seems to confront the issue between semi-abstraction and realism. It’s about portals, passageways into the realm into and through the cloud. The third in a series of four, “Veritas,” in Latin, means “Truth.” In a day where truth is often hard to come by, as we are questioned daily through the news, the question from Pilate was, “What is truth.” For me, the truth always comes back to Nature. It doesn't know anything but truth, being, what IS. I have chosen the sun piercing through the clouds as my motif for truth. BODHISATTVA: “In Buddhism, Bodhisattva is the Sanskrit term for anyone who has generated Bodhicitta, a spontaneous wish and compassionate mind to attain Buddhahood for the benefit of all sentient beings; a person who is able to reach nirvana but delays doing so out of compassion in order to save suffering beings.” For me, all things are connected by spiritual Being. That includes and is found in the appearance of a beautiful column of cloud, hovering above a field. 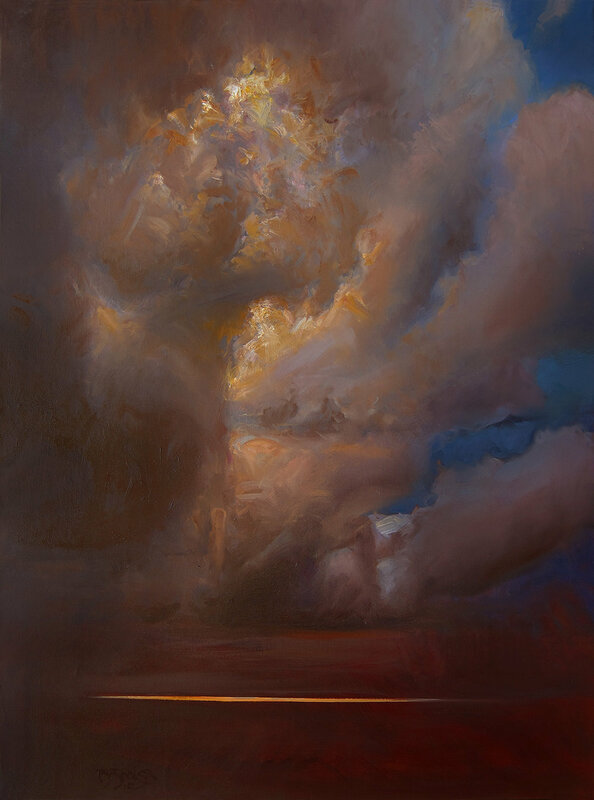 I launch out into the deep with an ethereal, spiritual cloud piece which is built up with layers of transparent color glazes, and varnished in between each and every layer. The painter, Richard Diebenkorn, said something to the effect of addressing what is uncertain. This is my challenge, and my freedom now. Quite unlike anything I’ve ever done, this is a largely spiritual painting, one might even call Symbolism. Of course, Turner, at times like this, is an influence. Taking out all detail, this subject matter becomes far more about emotion - what it’s like to stand at the precipice and being bathed in Light. 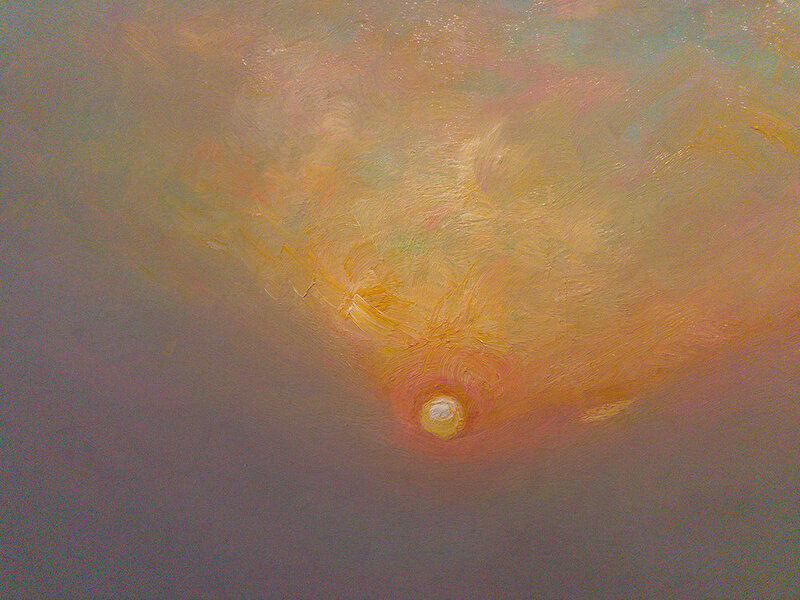 Clouds for me are a constant muse to paint. Sometimes it’s key to leave best laid plans alone; so not painting a cloud this time, while painting the background, presented a more spiritual edge to the painting.